I was cheered when I opened my Scientific American this month to read an overdue opinion put forth by the mag’s entire editorial board, entitled “Don’t Blind NASA to Earth’s Climate.” In it, the editors call out Senator and presidential candidate Ted Cruz (R-TX) for “egging on” his fellow congressional Republicans to cut NASA’s Earth Science budget by $260 million. Climate change-denying politicians say they want that money to go to the robotic voyage to Europa, Jupiter’s frozen moon. But NASA only needs $30 million for that mission. 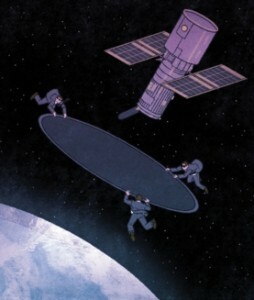 Look Anywhere But Earth – Graphic: Morgan Schweitzer, Scientific American. Cruz – who bears an eerie likeness to Senator Joe McCarthy, the 1950’s witch hunting, career-ruining Communist chaser – claims Earth science is not part of the agency’s “core mission” (wrong) and that the field is not even a “hard science” (nauseatingly wrong). It’s amazing how these guys are forever pulling crap right out of their…. As for NASA’s sister agency, the National Oceanic and Atmospheric Administration, the lawgivers want to kill it outright. They slashed NOAA’s budget by 5 percent, and rationed out only $8.4 million rather than the $30 million requested to study the catastrophic acidification of the world’s oceans. They don’t want satellites analyzing the seas because that preposterous planet-killing problem is driven by climate change, which is a hoax, don’t ya know. In 2012 Congress unceremoniously tried to “move” NOAA’s Earth sensing sats to NASA’s jurisdiction, and make them point the other way…toward Jupiter, one supposes. Ah well, Sam. Your star-crossed effort was, as always, heroic. 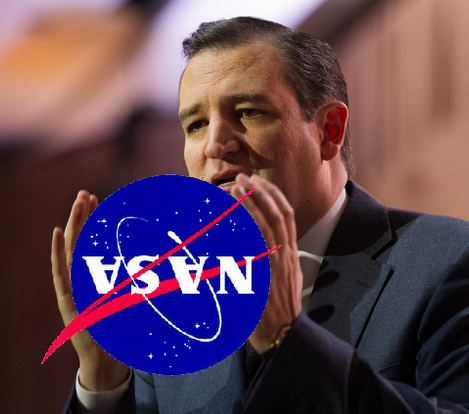 And this comes as no surprise: Cruz is Chair of the Senate Subcommittee on Space, Science, and Competitiveness. Why do they always give the gavel to a power-grubbing dolt who doesn’t even believe in science? So the naysaying deniers who are hired to protect the health and welfare of the people they represent will do anything to stifle the truth. Don’t pay attention to that man behind the curtain! Look at anything but the Earth.